That’s usually said of beef by the Cattlemen’s Beef Board and the National Cattlemen’s Beef Association – why there is a need for two beef-promoting organisations is beyond me – but tonight it was chicken in the form of chicken nachos. 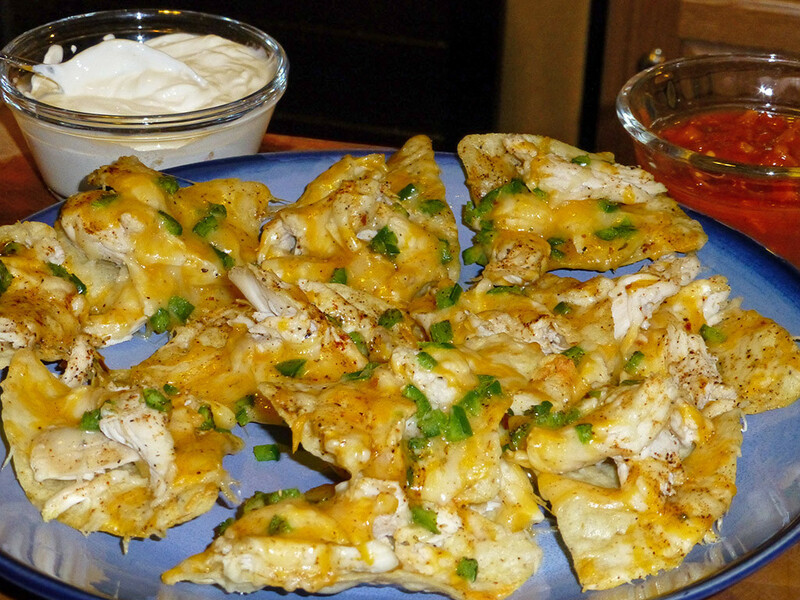 Thin, crisp tortilla chips that hold up to high heat; leftover roast chicken; cheddar, asadero, jack, and queso quesadilla cheeses; some diced jalapeno; and a sprinkling of Mexican spice blend. There are few dishes with a higher satisfaction to effort ratio. That they’re umami for the eyes is a bonus. Okay I see things are looking up in your household. You are starting to make what I’d call “summer food” ! I associate anything Mexican and jalapenos in general with sun, warmth, tee shirt material ! Well here in Paris, we’ve had two days of gorgeous soft weather ! And it looks like we will have another one today ! LOVELY ! Have to admit it took us all a bit by surprise ! I’m already planning to leave for an atelier an hour in advance to do some cartwheels over on the Great Lawn near my house. happy spring from Paris Lalo ! Yes, happy spring. I said to the guy who filled my car’s tank last night, “Nice to feel your hands again, eh?” He was genuinely eager for days two through four of 40-50F weather, and so am I. The deep cold has seemed interminable.